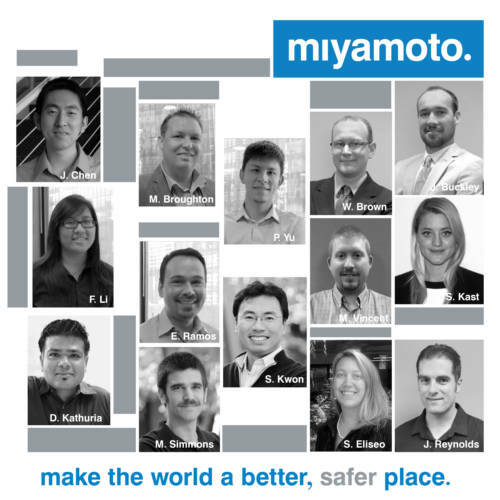 Miyamoto announced promotions of staff this week; this is the one of the largest number of promotions in the firm’s 70-year history. “The growth of our company creates growth in our people, and opportunities for those who excel and are committed to focusing on strength and improving professionally,” said CEO Dr. Kit Miyamoto. “Many of the staff promoted have been with us for many years and went through a lot of changes and challenges along the way. Deepansh has shown great business development skills by generating a large quantity of new business in Los Angeles. He also was instrumental in setting up the Miyamoto Colombia office. Deepansh has extensively traveled to Ecuador, Costa Rica, Peru and Chile for seismic risk-reduction programs and damage-assessment work. He will be responsible for both LA and International project development. Soon-Min’s unique strength is relationship building and business development. His skill was instrumental in Sacramento’s business development success. He pioneered a method of relationship building much valued in the company. As part of the San Francisco leadership team, he will focus on client and business development. Josh created the San Jose office from scratch nearly two years ago and in that time has developed strong relationships with previous and new Bay Area clients. Josh long has been the go-to engineer for University of California campus A&E and Facilities people at Irvine, Riverside and, now, Santa Cruz. Josh is continuing to expand Northern California business with intensive collaboration with the San Francisco office. Sabine spent 18 months in Haiti and 12 months in Nepal to develop these offices and kick start Miyamoto Relief, which won an ENR Best Global Project award under her tenure. She was a critical factor in building our relationships with USAID globally and in winning large-scale USAID contracts. Sabine will develop, coordinate and assist all international projects and offices, and also serves as Executive Director of Miyamoto Relief. For the past six years, Mark has lived and worked in Haiti. His dedication to the country, its people and engineering was critical to the success of many projects in Haiti, which won numerous awards. His fun and carefree attitude, even in the most stressful conditions, earn him respect from peers and clients alike. He is a leader with his own style. As a part of the Haiti leadership team, he will help grow this office. Eric has stepped in to take a firmwide leadership role in CAD and Revit coordination and development. He works closely with other designers throughout the company to continuously improve our quality of work. Eric gained respect from others by helping others. In his new role, he is responsible for CAD/Revit coordination company-wide. After spending 2½ years on a project in Shanghai, Philip took on major responsibilities in the Los Angeles office, primarily on production and guiding our team to deliver multiple challenging projects with his creative engineering solutions. He will be responsible for LA project production and management. Wayne has demonstrated his abilities for advanced analysis and seismic evaluation of existing buildings throughout the Southern California region. He has developed advanced analysis techniques for super tall tilt-up panels, as well as created spreadsheets for rapid comparisons of various structural steel building systems. Wayne also chairs the Structural Engineers Association of San Diego’s Existing Building Committee. Jon has earned great respect from everyone he has worked with, especially our clients. His average turnaround time for RFIs seems to be less than five minutes and submittals are often returned in less than a day. He also spent his vacation in Haiti helping Miyamoto Relief. Jon also has become one of our SoCal parking structure gurus while continuing to effectively complete complex education projects. James has positioned himself as Orange County’s complex project lead engineer. His skills in advanced analysis, design of complex structures, such as the Van Ness Medical Office project in San Francisco or the smaller, more “architecturally interesting” University Athletic Club conversion to a creative office building, have been noted as strong successes from our clients’ perspective. James also has become the go-to engineer for any needs on the UC Irvine or UC Riverside campuses. Sonia has developed into a respected leader in engineering and training for the Sacramento team and is frequently the recipient of compliments from architects, contractors and even DSA plan checkers! Her knowledge of the codes is perfectly balanced by her spirited disposition, making her a pleasure to work with for everyone involved. Over her years with Miyamoto, beginning with us as an intern, Sonia has risen to be one of the main project managers in Sacramento. Frances worked on a large Shanghai project for two years and has been responsible for major LA projects. She has taken on ever-increasing responsibilities in many aspects of project delivery and is respected for her technical skills and ability to work with both staff and clients. Frances will take on more complicated and challenging projects. Mike is Sacramento’s go-to guy when it comes to managing large, complex projects. He is both well-liked and well-respected by our architectural clients and the contractors who implement our designs. Some of his recent and current works include upgrading twin 200,000-SF high-rise office towers with fluid viscous dampers and a $110-million medical adaptive re-use tenant improvement project. Mike started out with Miyamoto as an intern. He will be one of the main project managers in Sacramento. Michael has developed into one of the most trustworthy and efficient designers in the Southern California region operations. His work ethic, can-do attitude and dedication to detail are unmatched, and his reliability has been proven time and again. Michael is a welcome addition to any project team.